Big city bright lights, the city that never sleeps, blah blah blah. 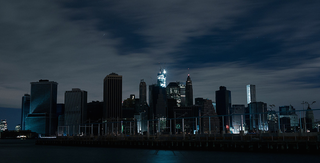 New York has a big-time problem with light pollution, and now a plan is in the works to significantly dim its skyline to cut carbon costs. It's about damn time! A Queens city council member named Donovan Richards introduced a bill called Lights Out last week that would institute new rules for buildings that keep their lights on at night, in response to the city's goal of cutting its emissions by 80 percent over the next 35 years. If passed, Lights Out would require a large chunk of NYC buildings to turn of their lights once the workday ends—rather than keeping some or all of them lit up as per tradition. How many buildings would be effected? Capital New York says the bill targets "Class B office buildings," which comprise "about a third of the city's office space," while Citylab's Sarah Goodyear pins the number of effected structures at 40,000. But it wouldn't necessarily mean that the whole skyline would go dark: As Goodyear rightfully points out, Donovan's bill has built-in ways for building owners to request exemption, including seasonal displays that must remain on—think Christmas windows—and buildings with historical significance—think the Chrysler Building, whose distinctive lights are part of its design—or even just tall buildings that need to be lit to warn pilots. It's worth pointing out that Donovan is just proposing a formal city rule for something that's already being done, informally, by other organizations. The Audubon Society has organized "lights out" programs in cities all over the country in order to help migrating birds navigate their way through bright, confusing cities, and some of those programs have grown nearly city-wide in scale already. Hundreds of buildings in NYC, Chicago, and other cities turn off their lights during the busiest migration season in the fall, including landmarks like the Chrysler Building.